﻿If one is to believe the comments of renowned contemporaries, the premiere of Beethoven’s "Kreutzer" Sonata in a Viennese concert hall must have been a highly risky venture. The ink was still wet on the manuscript when the English violin virtuoso George Bridgetower received his part only a few hours before the performance, and Beethoven partially improvised the piano part using a half-completed manuscript – a good 30 minutes long! 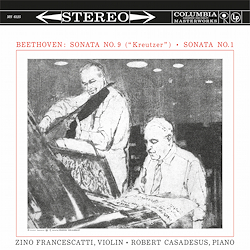 As a contrast, Zino Francescatti and Robert Casadeus have prepared themselves well for a well-founded, detailed and exciting rendering of this grand and complex chamber work. The slow introduction unfolds with anticipatory tension in the powerful key of A major, and then the violin enters into a fiery yet elegant dialogue with the evenly matched piano, all testifying to the absolute mastery of this exceptional duo. In the slow movement, the musical notions – carefully thought through yet not brooding – flow with intensity and melodic beauty. With joyous exuberance the two musicians present the final interplay, which alternates between melodic exaltation and sudden outbursts. This superb performance of one of the great showpieces of musical literature has certainly earned a hearty applause.